Your customers’ relationships with you are the only relationships you have as a business and you think a lot about them. But you’re one of a thousand things your customer thinks about in a week, and one of dozens of businesses. And they probably have their own ideas about how they want to engage with you (though they wouldn’t put it in those words) – assuming they think about you at all. This applies even to Google or Facebook (which brings me to the title of this post). There’s lots of data showing the high proportion of online time that people spend using Facebook, and the high volume of web searches that they do using Google. Facebook and Google are important. But that doesn’t mean they’re everything. It applies to Apple too, and there’s no better example than iCloud versus Dropbox. 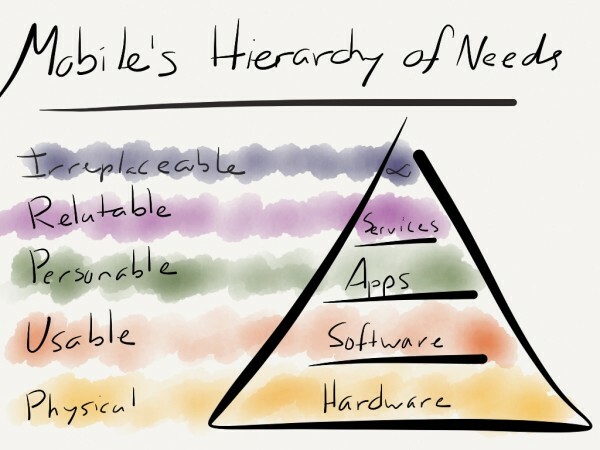 Steve Jobs famously called Dropbox “a feature, not a product.” And, if you look at the Mobile Hierarchy of Needs, he was right; Dropbox sits firmly in “Services,” one piece of the overall device value stack. But devices – even Apple ones – are ultimately a means to an end. For my mother, her iPad lets her see pictures of the grandchildren; for my wife, her PC was a lifeline to Taiwan for four years; for me, my phone keeps me connected and engaged in technology, regardless of time or place. It’s the ends that are meaningful and infinitely valuable, and Dropbox’s approach to my most important data1 is much more in line with the value I ascribe to that data: it’s available everywhere. Not so for iCloud: data is available only on Apple devices, and it’s not exactly clear how to get it out. iCloud is beneficial to Apple’s business model – more devices – yet actively hostile to my needs, in much the same way Facebook Home ignored how people actually use smartphones. 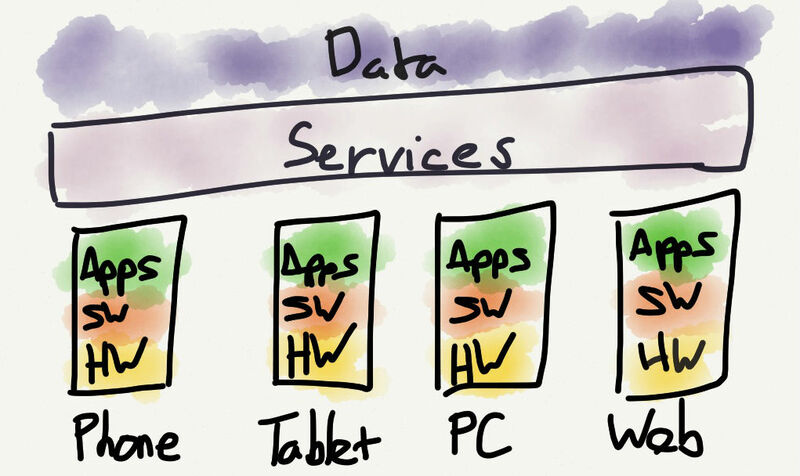 The problem for iCloud, and by extension Apple, is that services – driven by the need for data to be everywhere – are a horizontal layer, orthogonal to the the vertical nature of devices. Dropbox and other services are a threat to Apple in that they ultimately devalue hardware and minimize switching costs; this is exactly why Apple won’t buy Dropbox (except to kill it), and will never build a fully comparable product. The only coherent strategy for Apple is a walled-garden of sorts that protects their vertical business model. A services-centric company like Dropbox, on the other hand, ought to pursue a horizontal strategy predicated on maximizing the number of interconnects with the layers above and below; clients on every platform address the latter, and yesterday’s announcement of the Dropbox Platform are focused on the former. Taken together, she says Datastores and Drop-ins transform Dropbox into a platform that enables a “pervasive data layer” — a way for all your digital stuff to follow you everywhere, regardless of device, operating system, or app. The strategy is spot-on; while iOS and Android (and mostly Samsung) have effectively won the battle for devices, the winner in horizontal services will certainly not be Apple. There likely won’t be one clear-cut winner, as the individualized nature of data works against the network effects that would lead to winner-take-all. That said, Dropbox’s developer mindshare is a massive asset in this regard, especially if Dropbox is able to marshall developers as Dropbox advocates. Regardless, that set of contenders is good company and gives a hint as to why Dropbox’s valuation is so high.